In celebration of the 20 year anniversary of MABO, and NAIDOC Week 2012 the Arakwal people of Byron Bay are pleased to invite you to a historic retrospective screening of WALKING WITH MY SISTERS filmed between 1994 & 1998, an intimate human drama, which follows their own process of Native Title, through the story of their elders, the traditional Arakwal custodians of the Byron Bay area and their battle to prove their connection to the land where they grew up. Director Bronwyn Kidd met the sisters in December 1994, shy at first they were now starting to talk about their history in the coastal community of Byron Bay, North Coast NSW. In May the following year they made a bold step for them. They lodged their Native Title claim in order to finally have some real say over their traditional country. 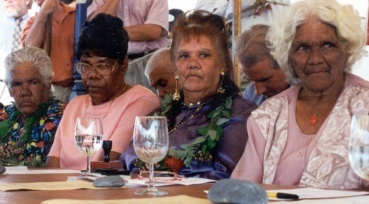 Edie Mabo’s landmark case two years before meant that Australian law finally recognised that aboriginal people occupied the land prior to Europeans and the Arakwal sisters were finally given hope that they too could continue to care for country and build a sustainable future for generations to come. Screening alongside ‘Walking With my Sisters’ will be an excerpt from the sequel ‘Back To Country’ (2000-2012) screening publicly for the first time also directed by Bronwyn Kidd and currently in production. ‘In Back To Country’ we now follow the next generation of family who have moved home to fight for their elders dreams. Their vision is to live, work and create a sustainable economic future in Byron Bay for the many generations of their people to come. The Arakwal people have achieved once of the most successful Native Title claim outcomes in mainland Australia through a series of historic Indigenous Land Use Agreements that included in 2001 an Australian first, the creation of a new national park, (Arakwal national park), joint managed by the Arakwal people of Byron Bay and the New South Wales National Parks Service. The films produced over 18 years represent the longest recording of a Native Title process in mainland Australia and will be followed by a Q and A with the Arakwal people and the filmmaker Bronwyn Kidd. Prior to the screening the Arakwal people will launch their brand new website sharing information about current projects, culture and caring for country.